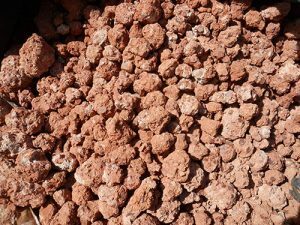 Aragonite occurs in a layer of red clay of Permian to Triassic age. Mention Morocco to a rockhound, and it is likely to bring to mind visions of exotic, rare, and beautiful minerals. It is certainly true that Morocco produces many such specimens. 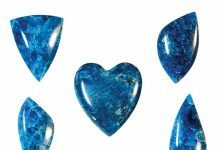 To some collectors, though, Morocco brings to mind vast quantities of cheap, low-quality minerals. It is true that a lot of junk does come out of Morocco. 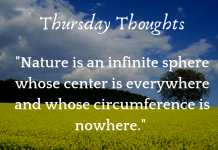 However, just because something is cheap and abundant does not mean that it is not desirable. One such mineral is aragonite. Good quality Moroccan aragonites can be found at reasonable prices at almost any rock show. 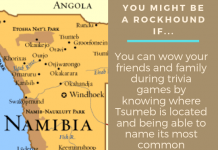 I recently had the opportunity to learn more about where this interesting mineral comes from. sign that translates to “Quarry of Aragonite”. Regular readers of Rock & Gem may remember that I have visited Morocco several times in search of minerals and fossils, and may know that I have been to some of the localities where rare and valuable minerals are found. In 2014, for example, I went to Imilchil, source of fluorapatite, andradite, and many other minerals (Rock & Gem, June 2015). On my last trip, in October of 2017, though, I visited the most prolific source of aragonite in Morocco. Like my other trips to Morocco, this one was arranged by tour leader Sara Mount of Silver Spring, Maryland. In Morocco, she works with brothers Adam and Aissa Aaronson. The Aaronsons, in addition to serving as tour guides, are in the fossil and mineral business and have developed connections with dealers and miners all over Morocco. Adam and Aissa also serve as our drivers, being as they own rugged four-wheel-drive SUVs, well suited for visiting mining areas and other back country sites. On this trip, there were 10 of us travelers, so we had a third driver, Ben Atmane Mobarak. He is a geologist with whom Adam and Aissa work. Adam and Aissa, in addition, act as translators for us. They speak Arabic, French, and Berber dialects, which are the main languages spoken in Morocco. Travel to Morocco is not difficult for Americans. No visa is required. There are direct flights from Washington, DC, and New York to Morocco, or one can connect through Europe. No vaccinations are required to visit Morocco, though a current tetanus booster is a good idea. It is also advisable to drink bottled water, but this is available everywhere in Morocco. Biting insects are not a major problem, but one should exercise caution when out picking up rocks, as a scorpion might be uncovered. There are a few venomous snakes, but they are rarely encountered. Getting around Morocco by road is not difficult. The major cities are now connected by freeways. Most towns are accessible by paved roads. Getting to some of the mining areas, though, requires off-road vehicles. A wide range of accommodations is available in Morocco, ranging from camping to luxury resorts. Sara always chooses comfortable hotels, because, while I may enjoy getting hot and dirty rock collecting during the day, a good shower and a comfortable bed at night are very nice. The best times to visit Morocco are the spring and the fall. In the summer, it can be brutally hot in the desert areas, while in the winter roads over the mountains can be closed by snow. The people of Morocco are always friendly. This is particularly true of the Berbers. Berbers are the native people of Morocco, who constitute the majority of the population in many of the mining areas. Morocco earns a lot of money from tourism, and they go to great lengths to keep tourists safe and make them feel welcome. I have never felt threatened in any way. The aragonite specimens usually come out of the ground as mudballs, with only the terminations showing. interesting crystal formations, beautiful colors, and relative abundance. Aragonite is a polymorph of calcite. That is, the two minerals have the same chemical composition, calcium carbonate, CaCO3, but crystallize in different systems. Calcite crystallizes in the hexagonal system, while aragonite crystallizes in the orthorhombic system. 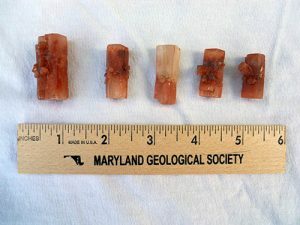 Single crystals of aragonite are typically long, slender needles or tabular plates. Commonly, however, aragonite occurs as “trillings”, which consist of three twinned crystals forming pseudohexagonal prisms, or “pseudohexagons”. These crystals are usually six-sided with flat terminations, superficially shaped like many beryl crystals. The type locality of aragonite, Aragon, Spain, is famous for such crystals. According to some authorities, aragonite forms at higher temperatures than does calcite. Aragonite also forms through biological processes; it is the main mineral component of mollusk shells and pearls. Over geological time, aragonite will alter to calcite. The result of such alteration is a calcite paramorph of aragonite. The Moroccan locality best known for its abundance of aragonite is near the town of Tazouta, about 30 miles southeast of Fes, in the Middle Atlas Mountains. Sometimes, the locality is given as Sefrou, a town about 15 miles from Tazouta. Many specimens offered for sale at rock shows are simply labeled as “Morocco.” This is unfortunate, as there are other localities in Morocco that also produce aragonite. The countryside around Tazouta is hilly and sparsely vegetated, though not far away begin the verdant cedar forests for which the Middle Atlas Mountains are known. There is quite a bit of ground water in the area, though, which supports irrigated agriculture. Cherries are the major crop of the area. This site has been known for aragonite for at least 60 years. 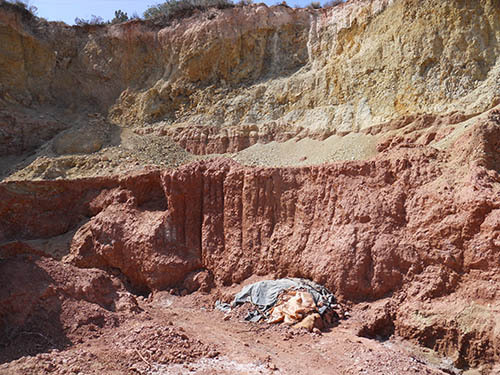 At Tazouta, aragonite specimens occur as floaters in a layer of red clay of Permian to Triassic age. The specimens from Tazouta typically consist of dozens of pseudohexagons radiating from a common center, forming round to oblong clusters. Most such clusters are a few inches across. In some specimens, though, many clusters may merge together, forming aggregates that may be several feet across. 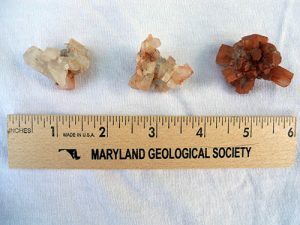 Some smaller specimens, usually less than 2 inches, consist of one large pseudohexagon, with or without smaller crystals radiating from its center. Most specimens are reddish-brown in color due to inclusions of iron oxides, though some may also be colorless or white. The aragonite mine at Tazouta is not a huge operation as mines go. It is a surface mining operation and covers perhaps several acres. At present, they are digging horizontally into the side of a hill. There are a few shallow holes in the hillside, but no underground workings. A backhoe is used to remove overburden. Aragonite specimens are then recovered with hand tools. Most specimens come out of the ground as mudballs, with only the terminations showing. There is not much surface water at Tazouta, so the specimens are hauled to a river several miles away where they are washed. They are then packed up for export or for sale at Moroccan rock shops and souvenir stands. Aragonite from Tazouta ranges in color from white to red, with red, due to iron oxides, being the most common color. Adam is a major buyer of aragonites from Tazouta. In 2017, for example, he exported 1,000 boxes (three shipping containers) full of aragonite, totaling around a million specimens, to China. He thus knows the owner of the mine, a man named Aziz, very well. It was through this connection that we were able to visit the locality. We began our day in Fes. Fes is a study in contrasts. The medina, or old city, dates back about 1,000 years. It consists of a maze of narrow streets, most accessible only on foot or by pack animals such as donkeys and mules. A knowledgeable, trusted guide is a must when visiting the medina. Around the medina, however, has grown a thoroughly modern city, complete with traffic jams, shopping malls, and American fast food chains. (Incidentally, I never saw anyone in Fes wearing a Fes hat.) Once out of the Fes traffic, it was an easy drive on two-lane, paved roads to the mine. 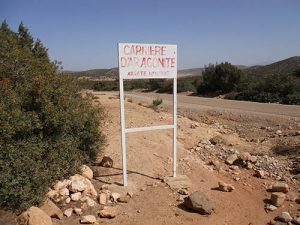 The mine entrance is marked with a sign reading CARRIERE D’ARAGONITE (“Quarry of Aragonite”). The mine itself is only few yards off the road. We arrived at the mine around mid-morning. Aziz arrived shortly thereafter. Normally, about eight to 10 men would be working at the mine. However, that day they were expecting a visit from government mine inspectors, so no one was working. We were given an explanation of how the operation works, and we were then given free rein to explore it ourselves. Aziz also graciously gave us permission to collect a few specimens, and to keep what we found. There were aragonite specimens everywhere. Most were small, perhaps too small to interest the miners, but nice pieces nonetheless. In many places, aragonite could be seen in the side of the hill. In most instances, only the hexagonal terminations were visible. There were piles of recently-mined specimens, still covered with dried mud, but we did not try to collect those. There were plenty of others to be found. At the back of the mine, we were shown what was said to be the largest aragonite specimen ever found at Tazouta. Still embedded in the hillside, it was an aggregate measuring some 12 to 15 feet long, 3 to 4 feet thick, and of unknown depth in the wall. 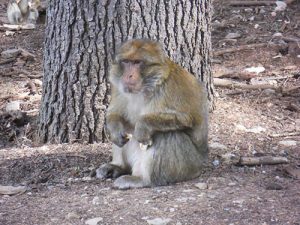 The endangered Barbary macaque inhabits the cedar forest between Tazouta and Midelt. to encase it in a plaster jacket, as is done for large dinosaur bones and other fossils. Adam and Aissa have extensive experience with such techniques from their fossil business. I saw Adam again in Tucson in February of 2018, and he told me that they still had not gotten it out. Whatever they do, it is likely to require a large crane and a big truck. I quickly filled up a small canvas bag with small specimens. I found many single pseudohexagons and several small clusters. Others in our group did the same. I picked up one piece that weighed about 10 pounds, but it looked to be too fragile to bring home without special packing, which I did not have, so I left it behind. Most of the smaller pieces had some dried clay on them, which served to protect them. We would have a chance later in the trip to clean and properly wrap them. I was hoping to buy a box of specimens and have them shipped back, but they are not sold at the mine. No matter. They are easy enough to obtain in the US. All too soon it was time to leave, as we had to be in Midelt (the mineral capital of Morocco; see Rock & Gem May 2011) that evening. So, we thanked Aziz, loaded our finds into our vehicles, and hit the road. As there were no restaurants in the area, we soon stopped for a roadside picnic, consisting of bread, canned tuna, sardines, and fruit. This is something that Sara’s groups do frequently for lunch in Morocco, as we are often off the beaten path around the middle of the day. Later, on our way to Midelt, we would encounter some of the native wildlife of the cedar forests, monkeys known as Barbary macaques. Because they have no tails, they are also known as “Barbary apes”. The Barbary macaque is considered an endangered species, found only in Morocco and Algeria, with a small population on Gibraltar. Deforestation is a major threat to this species. While one is not supposed to feed the monkeys, some have become used to being fed anyway and will approach close enough for pictures. They did not, however, try to jump on us. Aragonite specimens from Tazouta can frequently be seen on mineral dealers’ tables. Most are of reasonable quality, and they are usually not expensive. Because they are so abundant, almost any collector can have them in their collection. So, while I, like most mineral collectors, appreciate the rare and beautiful specimens that Morocco produces, I am also glad that there are places like Tazouta, where good specimens are, literally, common as dirt. Some smaller specimens consist of one large pseudohexagon, with or without a few smaller crystals attached. 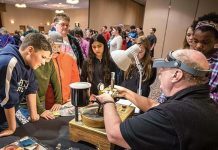 A writer and a longtime collector of minerals, fossils, and gemstones, he has traveled extensively in pursuit of the hobby. He is active in several Maryland clubs and is a dealer at area shows. He holds a Ph. D. in entomology and works for the USDA in Beltsville, Maryland.